Grab your credit cards and comfortable shoes: It’s time to go holiday shopping! Whether you’re hunting down gifts for Hannukah, Christmas, Kwanzaa or Festivus, you can make this year’s spending marathon stress-free the easy way: Sync your shopping list with your monthly cycle! Read on to find out which stores will make you happiest and which overspending pitfalls to avoid based on the week you’re on in your monthly cycle…. Aim to shop at mom-and-pop stores and neighborhood boutiques during your Week 1. Low estrogen at the start of this week combined with period-related aches and fatigue can sap your mental and physical energy, making it easier to get drained when snaking through bumper-to-bumper traffic and pushing your way through crowded mega-store aisles. What’s more, as estrogen rises throughout your Week 1, it makes you enjoy chatting more with others, so you’ll appreciate the personalized attention and friendliness of a smaller store. To save money: Bring your shopping list with you–and stick to it. This will help you avoid filling your cart with lots of impulse items for yourself (such as bath products, beauty items and anything placed strategically close to a cash register), which you’re prone to do in your Week 1 as a way to counter menstrual discomfort. 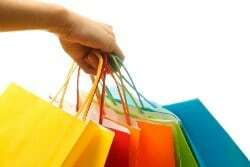 Week 2 is the best time to head to the mall, a “big box” store or retailers that are far away. Estrogen and testosterone reach their peaks during this week of your cycle and this gives you lots of energy, endurance and optimism—all traits that will help you brave the mega-crowds, snarled traffic, extra-long lines and grumpy overworked salespeople while keeping holiday spirits high. These hormones also make you crave adventure and new experiences, so a long trip to a new shop is especially fun. To save money: Take time to comparison shop and look for coupons and deals before purchasing gifts so you can get them at a lower price. High estrogen and testosterone are ratcheting up your confidence, making you feel like you’ve got more money to spend than you really do, which can lead you to buying an item despite its overinflated price tag. Sedating progesterone rises during your Week 3, sapping your energy and endurance and making you tire out more quickly than in the previous two weeks of your cycle. So you’ll likely be happiest doing your holiday shopping at one-stop shops and department stores that have lots of different types of items all under one roof, making it easy to get more gift-buying done in less time. To save money: Stash snacks in your purse, like nuts or granola bars. Progesterone is making you hungrier during your Week 3, and a 2010 study shows that hungry shoppers make worse buying decisions than those with full bellies. Turn to the Internet, catalogues and home shopping channels. During these premenstrual days, estrogen plunges and it’s taking your patience with jostling crowds, honking traffic and pushy salespeople down with it. Plus, it’s making you more sensitive to pain, such as being bumped, stepped on or elbowed by fellow shoppers in their mad dash for the last on-sale item. To save money: Try to avoid going overboard on high-priced “medicinal shopping” for yourself (for instance, splurging on diamond earrings or a designer handbag). Research shows we’re more prone to expensive splurges during our premenstrual week as a way to combat descending hormone irritability and achiness. Testosterone peaks in the early part of the day, which gives men lots of energy, but also makes them more likely to get cranky over little frustrations, like pushing through smelly crowds and competing for the lone available parking space. As a result, he’ll be happier visiting smaller boutiques, which are typically less packed. High testosterone also heightens men’s spatial abilities, so these are the hours they’ll map out the fastest traveling routes for stores that are long distances away. To save money: Give him a list to stick to. High testosterone makes men more impulsive, so they’re likely to put just about anything in their cart that catches their eye. Now is the time to shop at the mall and mega-stores with your guy. Testosterone dips to the middle of its cycle in these hours in men, so they’ll still have lots of energy and stamina to withstand long lines and visits to lots of stores, however, they’ll also be less easily irritated and have more patience with crowds and while jockeying for parking spaces. To save money: Encourage him to look for bargains. Since men are a tad less impulsive during these hours thanks to declining testosterone, they’ll be a bit more open to comparison shopping till they find the best price. When the sun goes down, it’s time for guys to turn to the Internet, catalogues and home shopping channels. That’s because testosterone drops to its lowest level, which makes their energy, stamina and concentration bottom out. As a result, they may feel too sapped to hit the stores. To save money: Feed him his favorite energizing foods. Otherwise, he may be tempted to settle on a pricey product just so he can stop shopping and take a nap.